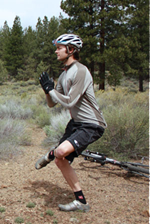 Experience less muscle soreness after riding. Recover faster and more easily. Improve range of motion in major joints. Reduce or eliminate postural pain. BikeYoga loosens up typically tight areas in cyclists: hips and lower backs, neck and shoulders. Hamstrings are gently lengthened while back muscles and core are strengthened. This program is designed with simple and basic yoga techniques for strength, relaxation and ease of movement. No experience is necessary and BikeYoga is accessible to all ages and abilities. Most importantly, it works!